I am actually really looking forward to Christmas this year. I’ve made the decision not to blow the budget (though this will be tested when I go Christmas shopping this weekend), and to enjoy the decorating. Normally Matt will put up the tree, and when we were in the flat, that was pretty much the sum of our Christmas decoration effort. Oh no. Not this year! We need to get a new tree, as we’re a bit tight on space in the living room, but we’ll definitely be making up for lacklustre Christmas decorations over the last few years. Anyway, more on that later (maybe). After last week’s wonky floor issues, I made sure to take a best of three. The result? Another 2lb loss. Chuffed, chuffed, chuffed. That takes me to 8lbs I think, properly into my new stone. It’s been a pretty good week generally, and I definitely think I’m reaping the benefits of it. I’d set myself three challenges last week – go for a good walk, get some yoga in, and accept and complete all my Smart Coach challenges on my UP. On Saturday, Matt and I were focused on the housework and getting more boxes shifted. It was really good to have a clean through, as we don’t have quite as many obstacles to negotiate now. Mum popped over in the afternoon. It was nice to have a catch up as I hadn’t spoken to her much in the week. I think Saturday was the first day that is has felt really wintery here. I hung the washing out (I know, optimistic! ), and the wind had a real bite to it. Sunday wasn’t quite so chilly as the wind had dropped off quite nicely. The sun was shining, we didn’t have much left to do at home, so Matt and I headed out for a bimble. I opted for a bridleway that I wanted to know where it went. It’s just around the corner from us, and goes off in a steep and relatively long hill. We were “labradored” about half way up by this lunatic yellow Labrador who was just so pleased with life and thought everything was marvellous. We made a fuss and chatted to her owner, who then apologised profusely when the dog jumped up with muddy feet. I didn’t mind – our old dog did worse I’m sure! We stopped a couple more times as Matt found some things to photograph. It really was such a gorgeous day. Eventually the bridleway came out at a farm with a stable yard. The track was quite muddy so we didn’t carry on exploring north, and so with a big inhale of the lovely smell of haylage (one of my favourite smells, which reminds me of pottering around the yard when I used to ride), we headed back towards the town. We found the road, town cemetery and primary school, which were previously unknown to us. It wasn’t a long walk, probably two miles maximum, but it was so nice to be out in the fresh air. I managed to fit in a very short yoga session, which felt great for my shoulders after being hunched over my desk all week. I accepted all my UP challenges too, and I’m pleased to report that I aced most of them too. I think I am getting into a good bedtime habit now, and I’m conscious of keeping my steps up during the day. Survive the Christmas shop on Exeter high street. Good luck to me! I’ve done a little bit of online shopping, but not much. A plan of attack is being formulated and may involve breakfast in the city. Explore a different part of where I live. So much to explore! Do you go all out on the Christmas decorations? When does your tree get put up? Categories: Weigh in Wednesday | Tags: exploring, weigh in wednesday, weight loss, weight loss journey, Yoga | Permalink. If you missed Part 1, it’s probably worth a quick catch up here. When the alarm went off on Sunday, I opened my eyes and felt rested. Actual, proper rest. This literally never happens. I had the best night’s sleep I’d probably had in months. The fact that I could barely move my legs was neither here nor there! My muscles ached. Maybe more than ached. While I’d had a good sleep, the fact I was barely mobile made me wonder whether I would be able to do Day 2. Mentally, I’d considered phoning in sick. As I woke up properly, I realised that I was being completely stupid. No one would have noticed my uncanny resemblance to a piece of wood – they were probably all feeling reasonably similar (which was later confirmed when I got to the studio). Driving through the fog, working out the best route and considering where to park, I felt I’d made the right decision. This was only further confirmed by the easy welcome when I stepped through the door. It felt good. I set out my mat in the same place (total creature of habit) and we practised what we’d learnt the previous day. Despite thinking that my legs (which is where I had most of the soreness) were going to snap if I tried to bend them, the flow was much easier than I was expecting it to be. After the sun salutations, Chris talked us through bandhas. During this part, I learnt I actually have lower stomach muscles. I cannot think of a time when I have ever felt them before. Not even after an abs class at the gym. Turns out that I probably very rarely used these muscles, as after a while of using them, I found they ached, and later in the day, I found sneezing quite painful. This lead on to some balances. I think it is fair to say that my balance isn’t amazing. I’m not sure why, other than I can only imagine it is because I a) don’t concentrate enough, and b) don’t engage the muscles needed for balance all that often. It seemed that I wasn’t the only one having problems in this area. What probably made it worse for me was as soon as I saw the guy to my left start to wobble or move, I followed suit. If I couldn’t see him though, it was much better. After lunch, Chris talked about establishing a home practice, and carving out a space, both physically to roll your mat out, but also in terms of your diary. Yoga is best done in the morning apparently, and some practice is better than none. With this in mind, I’m trying to suss out how to incorporate this into my life in a more suitable way. Towards the end, the more adventurous amongst us got to play a bit with back bends and inversions. I was able to take part in the back bends, but the inversion (shoulder stand) was a bit beyond me. I think I may have smothered myself with my own chest if I had attempted the shoulder stand! Day 2 was less physically intensive than Day 1, but it was more subtle. There was lots of good information throughout and I actually feel that I understand now that yoga isn’t just a relaxing activity to while away the time and get a good stretch. Don’t get me wrong, there is stretching, but it is also uplifting and stress busting, and inspiring and grounding, and there is so much more beyond just moving. I absolutely would recommend the Ashtanga Yoga Workshop if anyone was in the market for an introduction to Ashtanga yoga. The studio is really lovely – clean, warm and with plenty of equipment, and the people are very friendly and welcoming. I plan to go back to the Mysore classes once I have established a home practice. I feel like I have learnt a lot, and I’m desperate not to lose my focus on it. Get on the front row. I’m usually a back row kinda person, but I scooted forward to the front when I realised the second row had become the front row. Don’t think people are watching you. Firstly, they won’t be. They’ll be too busy trying to make sure that their arm/hand/foot/leg/gaze is in the right place to notice what you’re doing. Secondly, you’ll be so busy trying to make sure that your arm/hand/foot/leg/gaze is in the right place that you won’t notice if they’re watching. The only person that matters when it comes to watching you is the teacher, who might adjust you. Don’t think that all the participants are all going to be super-flexible, lithe athletes clad in Lululemon. I am living proof that this isn’t the case. We had a really good mix – from people like me, to an ironman athlete, to a yogi who had been practising for a year or so, to the stay-at-home mums who just seemed to want a bit of sanity back in their lives. It isn’t serious. Well, at least this workshop wasn’t. It was good fun, if not hard work sometimes. Bodily functions will happen. People will snore during savasana. Your top will probably ride up. You’ll probably get a giggling fit and collapse, and if you don’t, someone else will. It doesn’t have to be serious. So, as I said, this wasn’t exactly a bucket list item for me, but it was something that I wanted to do, and I’m really glad I did it. Do you have anything similar you’d like to have a go at? 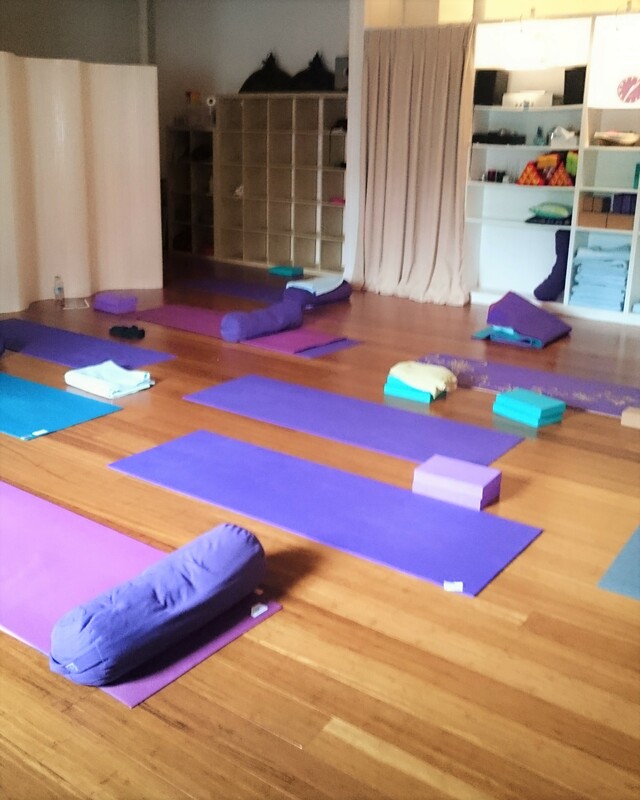 Categories: Being Active | Tags: Ashtanga, Exeter, Yoga | Permalink. The Snickers advert with Joan Collins in always makes me laugh. Sadly, the reality is that it seems I turn into a diva (though not anywhere approaching glamourous) if I find myself in the situation where I struggle to cope. Matt tells me that one of the things that really makes a difference to how I am and how well I cope with stuff is when I practice yoga. Or, rather, as I learnt this weekend, practice the poses. I’ve been meaning to go on a yoga workshop for some time. I wouldn’t go so far as to say it was on my bucket list, but it is something I have wanted to do just for me. I was googling yoga studios locally, and came across the Ashtanga Yoga Workshop in Exeter. I read the reviews, browsed their website and put my name down for the Beginners 2-Day Intensive workshop. This would probably have been around May. I knew the house move was going to take precedence for a while, but that we would definitely have moved house by 3rd October when the workshop started. In the run up to the workshop, I’d had all these great ideas about how the unpacking would be finished in the first week, and I’d be able to roll my mat out in the spare bedroom and get back into it before the workshop. Yeah. That didn’t happen. In a way, I’m kind of glad, as I went to the workshop with no bad habits formed. My history with yoga has been primarily gym class based, running through various poses, trying to breathe through them, and treating it as exercise, and a relaxing one that that. No fast paced stuff, and definitely there was never any real sweating, and I can’t remember a time when the instructor would correct my form in a pose. This kind of moved across into my own home practice with YouTube videos. I didn’t know if I was following a particular style of yoga, or anything behind it. Turns out, there is a lot more to yoga than just the poses! On Day 1, I parked at the park and ride, and made my way to the studio for 10:45am. The studio is lovely. It’s a little cocoon away from the hustle and bustle, tucked down a little side street that you would miss if you weren’t looking for it. That said, it isn’t hard to find (the website directions are very good). Stepping in, the lighting is muted, it is warm, and smells cosy and welcoming. I didn’t know anyone else there, which was a little daunting, but quickly forgot all about it as I made friends with one of the ladies who I parked my mat next to. Chris, our teacher, asked us to introduce ourselves before talking about the workshop. First order of the day was to get us to breathe properly. I thought “huh? I am breathing, so surely that is good?”. Turns out I was wrong. Breathing fully, when you’re not used to doing it, is actually hard work, but also fascinating. Immediately this differed to what I had been shown previously – in through your nose, out through your mouth. Not in this workshop! No mouth breathing in any way. It wasn’t banned, but it felt much more effective to breathe through my nose. After a break, it was on to sun salutations (A and B). The idea was to apply the breathing techniques that we had used in the morning in physical practice in the afternoon. These deep breaths drive movement, not the other way around, as I often thought. I recognised the sun salutations from my previous dabbling. A little bit of dread filled me at the thought of it. I cannot hold downward dog for longer than literally 1 pant, let alone five full breaths. Nope. My wrists, elbows and shoulders just don’t get it. Chris said “try puppy pose”. What?! Puppy pose?! What is this? Turns out that puppy pose is something that I can work with to working up to full downward dog – there is progression! I immediately felt the weight of dread lift. Dread was swiftly replaced by sweat. Not quite dripping, but not far off! Thankfully I wasn’t the only one. After a couple of guided flows, and then a couple of solo flows, it was time for possibly one of the best bits of yoga… Savasana. Then lunch. Two great things! After lunch, there was an introduction to the opening chant. I thought I’d find it really cringey, but actually it was really engaging. I won’t lie, it probably won’t be something I’ll be able to remember for home practice though. Standing poses followed the chants and information about the Ashtanga style. Chris had warned us earlier that we may feel some emotions during poses that we weren’t expecting to feel. When he’d said it, I remembered Kino MacGregor (who I follow on Instagram) saying that she would cry during a specific back bend. I smiled, thinking that this is something that happened to those who were really “good” at yoga. So to say that when I felt white hot anger in a forward bend was a shock, was a bit of an understatement. I don’t understand why, and I was really surprised it happened. I put it down to tiredness. I came home feeling really grumpy. I was sore – my lower back felt like someone had sandpapered my muscles, my feet ached and my knees felt bruised. I wondered whether I could make it through to Day 2! I think this post has gone on long enough, so I’ll post about Day 2, and my thoughts separately. Have you been to a yoga workshop before? What did you think? Matt and I, for Day 9 of Janathon, trekked over 4 and a half miles around the NEC for Autosport International. It was interesting, and I enjoyed the live show. I thoroughly enjoyed the people watching too. I didn’t spot any big celebrities, though I did see Shane Lynch (of Boyzone fame). He’s drift car racing these days apparently. It was a long day, brightened by a pink Caddy and a well deserved coffee! Today's #janathon was more yoga. I can hold downward dog a bit longer! Hurrah! I was quite chuffed at being able to hold downward dog for a bit longer. I don’t think I’ve really ever said, but this is one of the poses I find most difficult. My legs just don’t want to straighten, and I get sore wrists so I always struggle to hold this pose. I’m not holding it for the 5 breaths that my old yoga teacher used to like us to hold, but it’s getting better. Which brings us up to today’s Janathon. I would like to think that some huffing and puffing as I walked out of the Apple shop (as in Apple products, not a greengrocer) would count, but I suspect not. My iPod has decided to stop syncing. I’ve tried all the tips suggested online by their support, but it isn’t playing ball. I had a problem with my old iPod a long time ago, and Apple were really good about it. Today, I wandered in and there was a queue for the tech team. I got to the guy who seemed to be coordinating, and he said I needed to make an appointment. No problem. He asked what was wrong with it, and I’d taken a screenshot of the issue with my phone to show (as my memory isn’t the best). He laughed and said that he was sure they could help with the (faulty) iPod, but he couldn’t do anything about my (working absolutely perfectly) Samsung mobile. Urgh, Apple snob. Then as I headed towards John Lewis, I thought I bet the Samsung tech team were having a quieter Sunday. I digress. Janathon has been a walk around town, some active (ish) housework, and some more yoga because I’m still a bit stiff. In Whole 30 news, everything is going pretty well. I felt a bit apprehensive about going away overnight and then to a show, but I planned it all – breakfast quiche and juice, salad and bananas, black coffee. Not a single non-Whole 30 thing passed our lips. There are a couple of things that I have noticed so far. The first is that I seem to be a lot thirstier at the moment. I don’t remember this being the case last time, and I don’t think I have added more salt into our food than normal (and I don’t add much generally). The second is that I seem to have missed the “kill all the things” stage, but I am firmly in the grips of the reputed “let me nap” feeling of days 6 and 7. I think the last thing I noticed is that last time we did a Whole 30, I ended up weighing literally every day in the first week or two just to see what the scale said. While I am interested, I’m not being driven half mad by daily scale watch. I’d like to know if there has been a weight loss, but in all honesty, I’m just too tired to have to deal with the “Woohoo it’s as/more than expected” or the “Boo, this isn’t enough”. Categories: Exercise | Tags: Janathon, weight loss, whole 30, whole30, Willpower, Yoga | Permalink.